Sue is Advanced Health Chiropractic’s superstar, she’s been with us for over 25 years! Sue brings to the team a wealth of experience – she’s seen lots of our practice members grow from adventurous, and sometime mischievous little children, through to adulthood, including AHC team members who have now gone on to study Chiropractic as a career themselves. Sue remembers a time when appointments were written in the book (not computer), and people did not need reminding when their appointments were (texts). She often shakes her head and smiles as new procedures are implemented, as she is quietly confident that ‘simple is best’ and most often she is right! She reminds us that it is the people contact and serving with excellence that matters, not all the ‘fandangle’. One aspect of Sue’s job she is particularly passionate about is the wonderful cuddles she gets to have with all the babies that come in to get checked and are now benefiting from chiropractic care. Seeing children flourish as their nerve systems start to fire and wire properly is close to Sue’s heart. She has a gorgeous grandson who has Autism and she’s seen first-hand what a difference chiropractic care has made in his life. Kristen, while living in the Cook Islands, joined Hash House Harriers where she was aptly named Momma Bear. This was due to her fantastic ability to relate to children, and always finishing the evening with more kids than she started with. As most mothers are, Kristen is the organiser of the family and while she is the only female in the house, she has a great knack of keeping the “boys” on the right track. Kristen is caring and because of her natural nurturing nature, she has opened the family to the benefits of chiropractic care of which she strongly supports. Kristen has a busy life and is enjoying working in the small, friendly team at AHC. When she has downtime she enjoys spending time doing hand-crafts like scrap-booking, sewing, painting, or out walking Dudley Dog at the many “dog-friendly” designated areas that are available in the Waitakere Ranges. 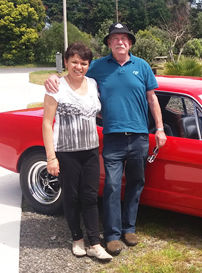 Byron and Judy are also enjoying the weekends cruising in their 65 “Fire Engine Red” Mustang. Judy came to us from the movie industry, having worked for Roadshow Entertainment as a receptionist for 25 years. With the downturn in the industry it was time to move on. Judy was already part of the chiropractic family as a member of another practice. Judy says, “being part of AHC is such an amazing opportunity and she’s always learning from the team”. Judy comes from a big family with four sisters, two brothers, and lots of nieces and nephews. Her interests are playing competition bowls, walking, yoga and spending time with husband Byron, son Glenn and fur baby, Georgie Girl. Corrine joined the AHC team already knowing the value of chiropractic care – she was one of our practice members! Before AHC, Corrine ran several businesses, including a florist shop based in the old Avondale Post Office building. Home life for Corrine, husband John, daughter Kayla and Corrine’s mum is in the beautiful carefree area of Cornwallis. Corrine also has two adult sons Steven and David. Weekends are spent mostly with family and friends. 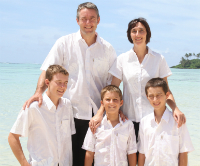 The family often jump into their boat and cross the Manukau Harbour to Oura Bay on the Awhitu Peninsula, where their extended family have a bach. Even the family’s fur baby, named “Chiro”, joins the family on the crossing – who said cats don’t like water! Corrine is a big part of our team – she’s incredibly caring and brings a great aptitude to the practice. The personal benefits of regular chiropractic care is what inspired Melanie to study Chiropractic – so much so she decided to move half way across the world from Namibia to enrol at the New Zealand College of Chiropractic. Melanie loves to make sure that everyone feels welcome at Advanced Health through exceptional service. Her talents, beside her contagious smile, are her authenticity and her passion to spread the seeds of health in her community. Melanie in her spare time loves drawing , exercising and exploring New Zealand’s nature. Contact us today to make an appointment with our friendly team!